In the remarkable city of Scottsdale, Arizona, you’ll find a master-planned community called Grayhawk. Grayhawk is composed of over 1,600 acres in the heart of Scottsdale. Known to celebrate the everyday pleasures, Grayhawk affords its residents a resort-like lifestyle that showcases the best parts of family in both of its interconnected neighborhoods. While distinct, The Park and The Retreat neighborhoods share a number of impressive qualities and features. Grayhawk as a whole is home to over 4,000 residences of varying sizes and architectural styles. Chosen by readers of Arizona Business Magazine as the state’s #1 Master-Planned Community, Grayhawk is widely considered one of the most popular master-planned communities in the Southwest. Grayhawk has all a prospective homebuyer could want or need with very diverse and luxurious housing options. There are condos, townhomes and gated single family homes in Grayhawk. In addition to great real estate options, Grayhawk is also home to the nationally acclaimed 36 hole Grayhawk Golf Course. The two Grayhawk neighborhoods feature exquisite architecture that perfectly complements the picturesque natural beauty of the Sonoran Desert that encircles the community. 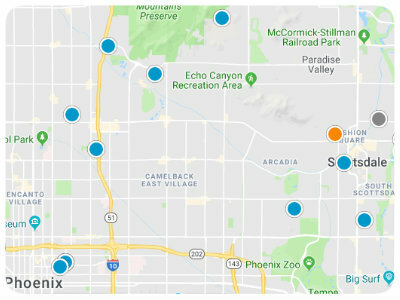 Grayhawk also boasts several neighborhood parks, 31 miles of multi-use trails, easy access to great shopping and dining, as well as close proximity to excellent schools. If you would like more information regarding homes for sale in the highly sought after community of Grayhawk in Scottsdale, Arizona, please do not hesitate to contact us today.